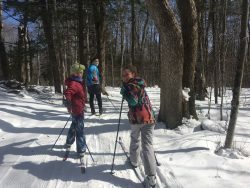 Wild Wings is a family friendly Nordic ski touring center. We are located in Peru, a small Vermont town, high up in the Green Mountain National Forest. Our trail system consists of loop trails that will satisfy all skill levels of cross-country skiers. Need to rent skis? Our rental shop is fully stocked with all sizes of classic equipment. See our rates page for rentals and trail passes. Traditionally, our trails have served classic cross-country skiers, but in 2018 we built a new 3k trail to accommodate both classic and skate skiing. Our Skiing Blog keeps you informed of trail and weather conditions and which trails are open or closed. Subscribe and an email will notify you of the day’s news blog post. If you prefer, you can use our page on TrailHub to monitor our trail conditions. We don’t want you to miss a great day and we never want you to arrive here to find we’ve had to close due to poor weather. Wild Wings Yoga Studio practices a vinyasa (movement following breath) style of yoga that we call “slow flow”. Here we are fortunate to practice in a warm, soft space, with large east facing windows and a warm wood stove. 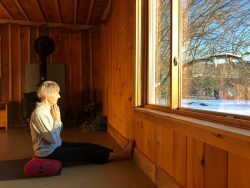 You can check the Yoga News Blog for updates and the current schedule. You can also subscribe and have them emailed straight to you.